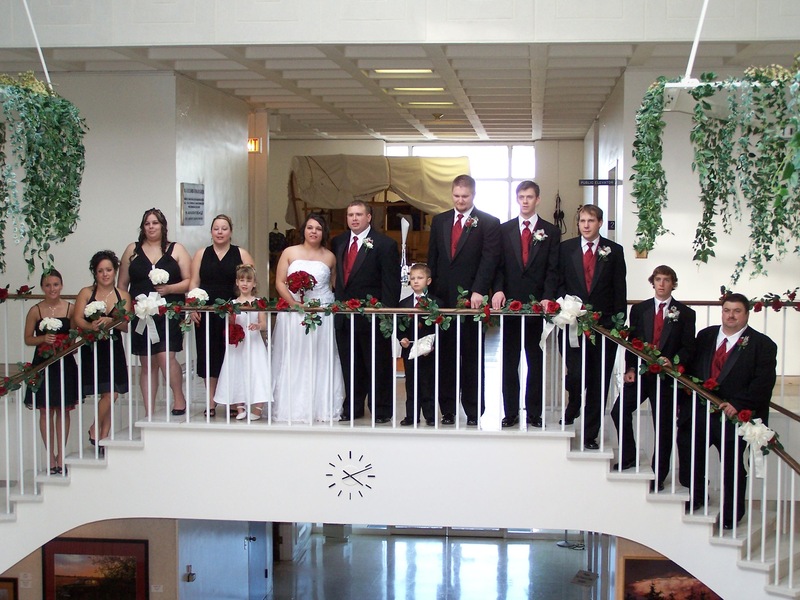 Make your special day one to remember with the help of historic Stuhr Museum. Let us assist you in planning for your wedding and creating an occasion that will help you make your own history. Our unique setting, with a variety of facilities and atmospheres on over 200 acres of natural beauty, has something to please everyone. For a formal, elegant setting, consider the Stuhr Building. If you prefer the great outdoors, our lovely outdoor Hornady Family Arbor allows you to celebrate in the fresh air. Of course, there is always the little white church for a traditional space. Stuhr Museum provides full-service capabilities including facility rentals, catering recommendations, entertainment options and historical enhancements. We can handle your special day for you and add the special, detailed touches that make Stuhr Museum so unique. You do not need to be a member to get married at Stuhr Museum. The historic Immanuel Evangelical Lutheran Church was originally from Hampton, Nebraska, as the Danish Lutheran Church. 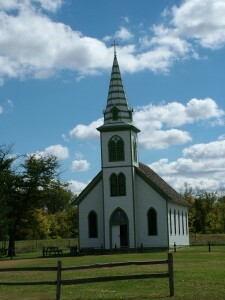 Available as a unique setting for weddings, baptisms, or other services, the ‘little white church’, neatly trimmed in country green, is nestled on the south end of the museum grounds. Built in 1888, the church stands symbolic of the thousands of rural churches that once peppered the great plains. The church capacity is 110 people, and while there is no heat or air conditioning in the church, dressing rooms & modern restrooms are located on-site. The Bridal Room is located near the church and is just a short walk across the parking lot. The Room is private for the Bride and her party to use to prepare for the big day and has a private attached restroom, a sink and counter area in the common room, and seating. Host a corporate event, private dinner party, meeting or retreat, formal reception, picnic, family gathering or class reunion at Stuhr Museum with our assistance and expertise. Looking for a special program or guest speaker? Make your special event one to remember with the help of Stuhr Museum. At Stuhr Museum, our specialty is making and preserving history. We do it every day! Let us assist you in planning your next event and creating an occasion that will go down in your history. Our unique setting, with a variety of facilities and atmospheres on over 200 acres of natural beauty, has something to please everyone. Choose from a barn lean-to that overlooks the open prairie to an outdoor arboretum that allows you to breathe in the fresh air to the elegant setting of the classy Stuhr Building. Stuhr Museum provides full-service capabilities including facility rentals, catering recommendations, entertainment options and historical enhancements. Large or small, we can handle your special event for you and add the special, detailed touches that make Stuhr Museum so unique. Entertain and involve your guests with organized activities, hands-on opportunities, and learning experiences! Programs from the Prairie available at Stuhr. Looking for a stunning backdrop for that family photo, senior picture or wedding portrait? Ask about holding your next portrait sitting at Stuhr Museum! 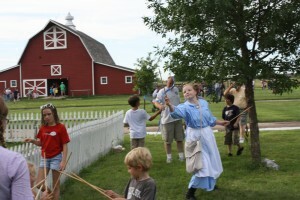 Prairie Birthday Parties! Inquire for details or click here! 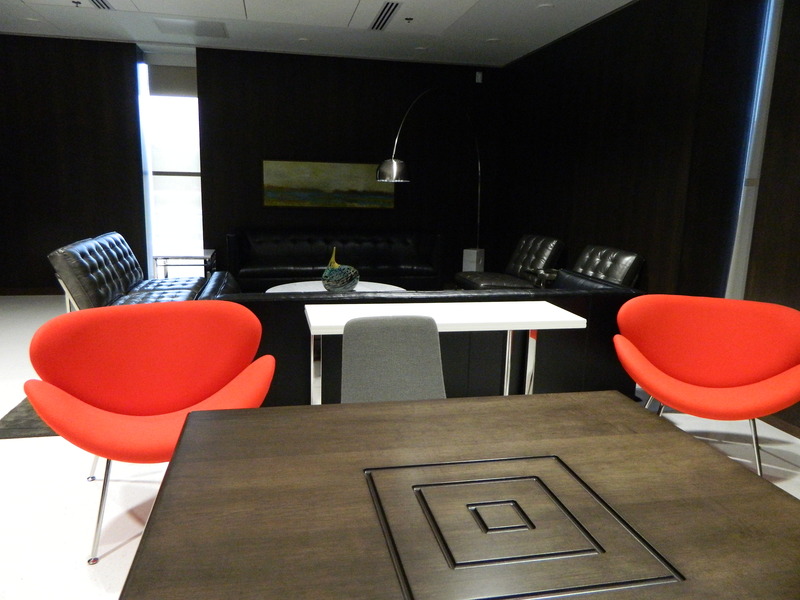 Be sure to ask about other event, catering and entertainment options. We are happy to give suggestions and ideas! For more information, please contact Facility Sales at 308-385-5316 x205 or email events@stuhrmuseum.org. The Leo B. Stuhr Building is the perfect place to host your reception, company party or gathering, family reunion, afternoon tea, wedding, or an exquisite evening gala. Spacious Porticos surround the building and are perfect for outdoor events. Inside, this stunning building displays beautiful marble flooring, incredible twin spiral staircases and four fountains providing an enchanting and classy environment. 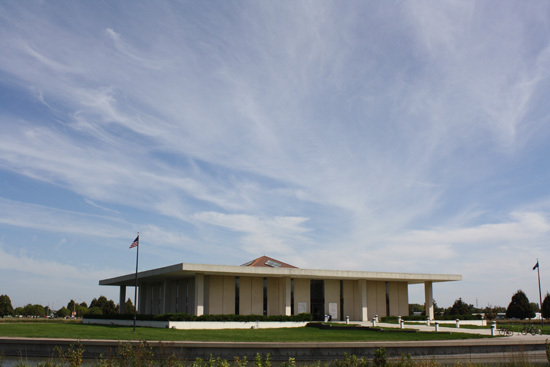 Edward Durell Stone, designer of the Kennedy Center of Performing Arts in Washington, D.C., also designed the Stuhr Building, which opened to the public in 1967. Interior rental spaces in the Leo B. Stuhr building include The Gretchen and Jack Dinsdale Gallery, Marval Hornady and Margaret Hornady and Don David Hall and the Clinton Cronin Hall with the attached Cronin, Fowles and Goering Kitchen. 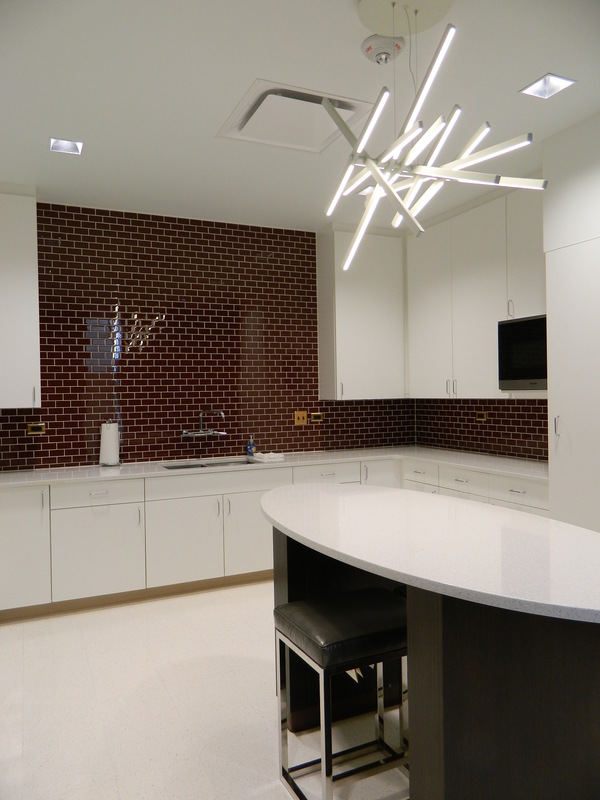 The CHI Health St. Francis Kitchen is on hand for use during catered events. Ten-foot wide paths wind through the picturesque environment you’ll find in the Hornady Family Arbor. 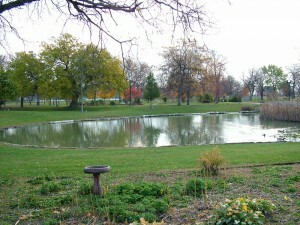 Complemented by a pond, windmill, wooden bridges, flower gardens, shrubs and picnic areas, this tree-filled haven is a peaceful, relaxing sanctuary for your next family reunion or company picnic. Sit for a spell on a shady bench in the Henry Fonda Rose Garden, or stand on the wooden bridge and feed the many ducks residing in the Arboretum. Admirers of flora and fauna alike will enjoy the varieties of flowers growing here in the arbor, from lilacs to irises and daisies to lilies. Located at the 1893 Farm, the lean-to of the classic ‘Red Barn’ is available by reservation for your next country-themed outdoor event. A lean-to, along with a large barnyard, is ready for games to be played or a BBQ dinner in this peaceful country setting. 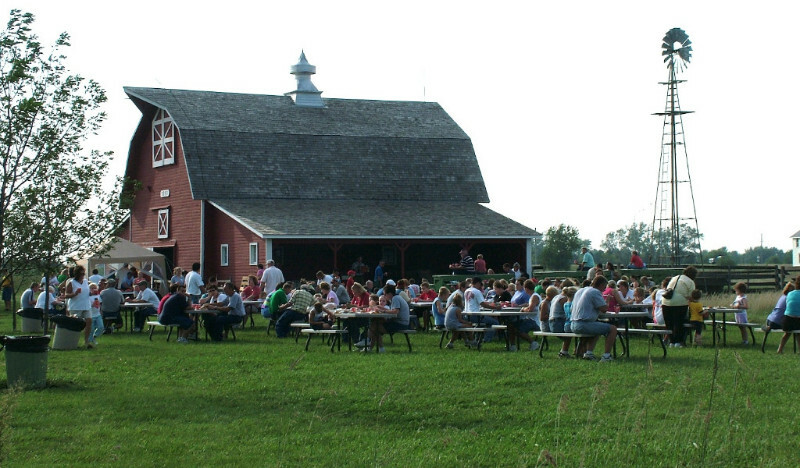 Resting next to the Cleary Farmhouse on the south portion of Stuhr Museum’s grounds, the big red barn will add a rustic touch to your next event. For more information, contact Facility Sales at 308-385-5316 x205 or email events@stuhrmuseum.org.